Okay so if you haven't heard of Minami, chances are you are either 1) not that interested in Vancouver's Japanese food or 2) living and eating under a rock. But if you really haven't heard of them, Minami is one of the Japanese restaurants under the Aburi brand and is the sister restaurant of the popular Miku and relatively new Aburi restaurant, Gyoza Bar (which I did a review of here). Although Minami isn't the first of the Aburi restaurants in Vancouver, I would definitely rank it as first among its sister restaurants. Here's a rundown of my meal during my most recent visit a few days ago. 4.5/5 - If you know oshi sushi, then the concept of the salmon oshi bites is probably not so foreign to you. This dish simply features four salmon oshi sushi topped with four different ingredients. My favourite among the selection would be the boar bacon due to its strong smoky flavour which compliments the rice and melty salmon underneath. For this reason, I actually ended up ordering a separate dish of just boar bacon salmon oshi sushi. No regrets at all. **Note that for the special order, each piece costs $4.50 instead of $4 in the regular order. ** I would've given this a 5/5 if not for my high expectations of oshi sushi thanks to Kishimoto. 4.5/5 - My main reason for my recent visit to Minami was actually because of their feature roll for the Sakura (cherry blossom) festival which only lasts for the month of April. This roll, appropriately named Sakura roll, is the beautiful lovechild of good sushi and cherry blossoms. It features a good variety of seafood, vegetables and cherry blossom that results in a pretty mouth watering combination of crunch and flavour. 4/5 - A good selection of sashimi but not the best. Some pieces lacked texture while others like the shrimp could have used a bit of crunch. Very beautiful plating though and bonus points for the amazingly crunchy seaweed underneath. 4/5 - No meal is complete without dessert. 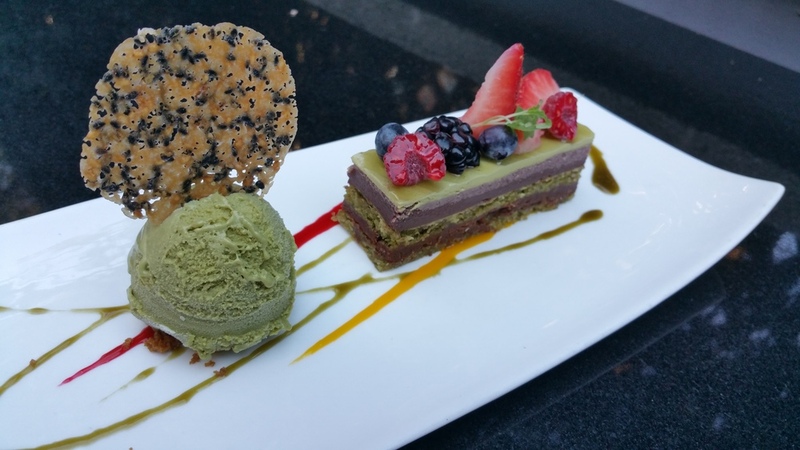 For me, no meal at Minami is complete without at least one of their matcha desserts. An overall pleasant dessert. I recently started going back to Minami after I had some visits to the other Aburi restaurants that left me completely unsatisfied and disappointed. I'm glad to know that Minami has kept it up and maintained their professionalism and attention to their food.